"We used the ScreenSteps tools and applied the methodology that Jonathan and I went over during our coaching calls, and this round of training went far better than the previous round of training. Our users are actually excited to begin using Salesforce." In the Fall of 2018, The Peninsula Jewish Community Center (PJCC) upgraded its customer relationship management (CRM) system, built on Salesforce Lightning, to streamline its operations and offer its guests a more personalized experience. Ryan, the Salesforce Support Specialist, was in charge of teaching 200+ employees how to use the new CRM system and did not want to stick with traditional training that put employees to sleep. We did an initial training to a small group of power users and it didn’t go very well. Attendees were bored and they couldn’t remember much of anything that we covered after training was over. I knew that if we were going to train all of the employees at PJCC, we had to come up with a different approach. Ryan is a talented trainer. He just used an outdated approach that had been passed down from other "expert" trainers. Ryan decided to use ScreenSteps to create training materials and worked with a ScreenSteps coach, Jonathan DeVore, Manager of Customer Success. Over the course of several months, Ryan and Jonathan worked together to develop a training curriculum that would be engaging and effective so that when the new system went live, employees were ready. The first thing Ryan did was document all of PJCC’s procedures in ScreenSteps so that there was one source of truth for using the new system. Ryan was glad that he created his how-to articles, checklists, and policies in ScreenSteps because as the new system matured, processes and procedures changed. With ScreenSteps, it was much easier to update the documentation and keep it accurate. 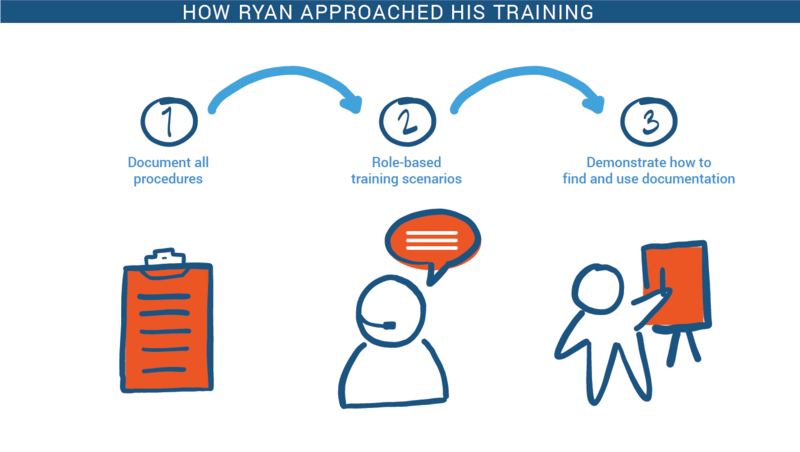 Along with getting the documentation ready, Ryan created role-based training curriculums that were specific to the jobs PJCC employees had to perform. While he did have some training sessions that were high-level overviews of the new system, Ryan focused on creating scenario-based exercises. Because the content was job-specific and relevant, employees were engaged and quickly able to pick up the new processes. During training, Ryan demonstrated how to reference the ScreenSteps articles when performing a procedure. Ryan leveraged the Chrome Browser extension to show employees how to use contextual help. He also had employees use the articles during training so that, if employees were unsure how to use the system after training, they would be able to search through ScreenSteps to find what they needed. Ryan’s alternative training approach using the ScreenSteps application and its training methodology was a huge success. We used the ScreenSteps tools and applied the methodology that Jonathan and I went over during our coaching calls, and this round of training went far better than the previous round of training. Our users are actually excited to begin using Salesforce. Even the consultants working with Ryan on the technical implementation thought that his training curriculum was top notch. The training sessions went really well. The participants were open, enthusiastic, and very quick at picking up on the content and skills they’ll need in order to navigate and “own” their new system. A huge part of this has to do with the quality and detail of the training material, training scenarios, hands-on practice, and iterative-training-session approach that Ryan implemented. It is, in all honesty, the best training program I’ve seen––in all of the projects that I’ve been involved with in my 6 years of consulting. When PJCC went live with the new system, 200+ employees were ready to roll. They felt comfortable with the new interface, the new processes, and were able to perform their job right from day one. Ryan’s team is excited, the consultants who implemented the new system are thrilled, and most importantly the employees at PJCC are proficient at doing their job.